The Christmas season has officially hit the White House! On Tuesday, First Lady Michelle Obama opened the doors to her home — or, as she calls it, “the People’s House” — for a media preview of its holiday decorations. Nearly 100 volunteers from around the country spent a week festively sprucing up the House, under the theme “Simple Gifts.” They made spectacular use of natural materials such as wood, paper, leaves, fruits and vegetables, and fabric. “The theme this year is ‘Simple Gifts,’ because in the end, the greatest blessings of all are the ones that don’t cost a thing,” Mrs. Obama said to invited military families who organize DC-area branches of the Marine Corps’ Toys for Tots drive. 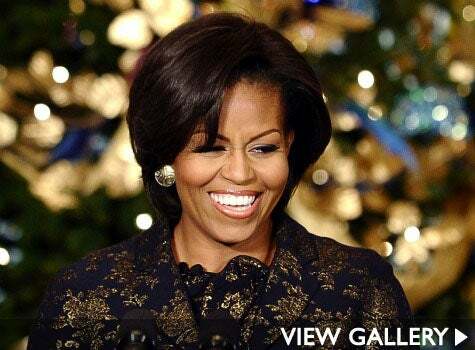 “The time that we spend with our loved ones, the freedoms we enjoy as Americans, and the joy we feel from reaching out to those in need.” Mrs. Obama also used the occasion to encourage Americans to participate in the Toys for Tots drive, which the Marine Corps has been doing for 63 years. The program has distributed over 400 million toys to almost 200 million disadvantaged children. You can donate new toys by dropping them in a Toys for Tots bin in your community, or make a monetary donation online. 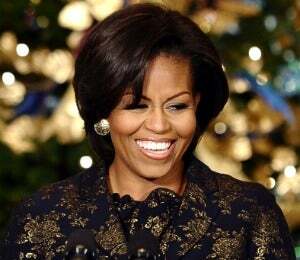 “I’m thrilled that the White House staff will be supporting their efforts with a toy drive to help make this holiday a little bit brighter for children right here in the D.C. community,” said Mrs. Obama, who pointed out a particular need for gifts for older pre-teen and teenage children, in addition to the littlest ones.